Bali is known for its spa culture – massage businesses are located on almost every street and nearly every hotel has a spa, as well. But what sets one spa in Bali apart from the rest? 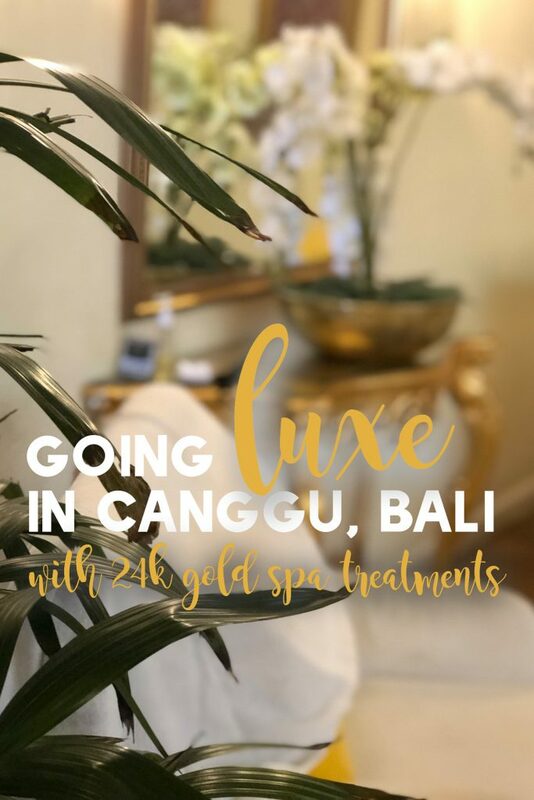 With 24 karat, real gold spa treatments – Goldust in Canggu has definitely raised the luxury bar when it comes to facials and spa treatments in Bali. The owner of Goldust has always had an affinity for all things GOLD (can you blame her?) and when combining her love for gold with her values for natural health and healing – Goldust was the perfect business endeavor. 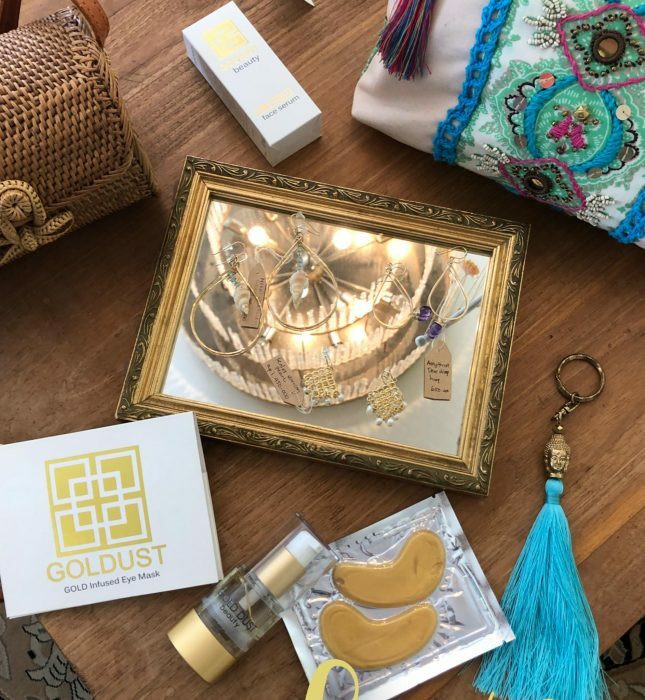 The owner of Goldust also took a few steps in her mothers’ shoes by adding the boutique (featuring in-house resort wear designs, handbags, clutches, jewelry and more). All the products are sourced right on the island of Bali and the designs are created by a family run factory right in Denpasar. From the boutique to the lounge to the treatments, Goldust will totally become one of your favorite stops in Bali! Each of the massage therapists at Goldust receive 100 hours of training per year and Goldust prides themselves on their ability to invest and assist their team of mostly female therapists – helping the women achieve their full potential as world-class professional therapists. The Goldust lounge where some of the treatments are performed – perfect for your girls’ group treatments! When I had my stress-buster treatment with 24k gold eye masks and a gold roller – I immediately understood the importance of the training for Goldust employees. I’ve had heaps of massages all over the island of Bali – from five-star resorts to $7-one hour massages on the side of the beach, and my massage at Goldust is definitely top three in Bali. My 90-minute treatment was such a treat to my sunburned skin and stressed shoulders (switching hotels every 2-3 nights definitely takes a toll on your body). I loved the philosophy of “un-hurried pampering” at Goldust – every knot in my shoulders was tended to patiently and with awesome results. 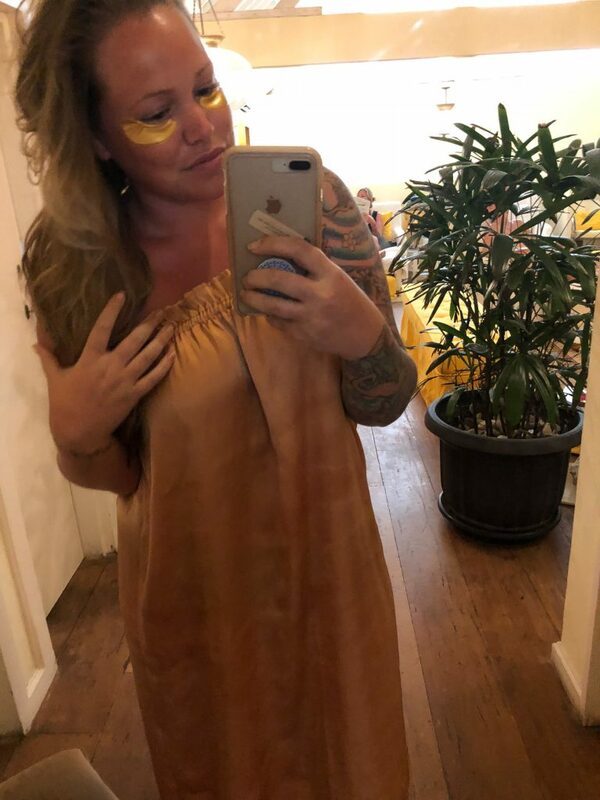 I left Goldust not only feeling refreshed but also looking refreshed, the 24k gold eye masks and gold roller worked wonders on my skin! (left) Pre-treatment I was pampered with water and fresh fruit! (right) During my treatment, I was adorned in a gold robe and treated with 24k gold eye masks. Gold has been used for centuries in various beauty regiments across the world – from the Ancient Egyptians to the Chinese dynasties. It is known as a luxurious and precious element and has recently been noted for its awesome anti-aging properties and ability to improve the overall appearance of the skin. 24 karat gold treatments not only hydrate the skin but also moisturize while reducing fine lines and wrinkles which come together to bring out a smooth and radiant appearance on the skin. Gold leaf will naturally rejuvenate skin and reduce wrinkled when applied to the face by maintaining collagen in the skin. Gold is also said to be able to transport oxygen molecules into the skin which can aid in cell renewal and can assist in fighting bacteria – making gold the perfect spot treatment for pimples. Some studies even suggest that gold can fight super bacteria which has built resistance to antibiotics. If blended or applied to the skin with oils or other beauty products, gold can increase the absorption rate of the other nutrients. Gold can actually encourage the absorption of other beauty products or topical medicine treatments – which makes it the perfect addition to ongoing facial care. 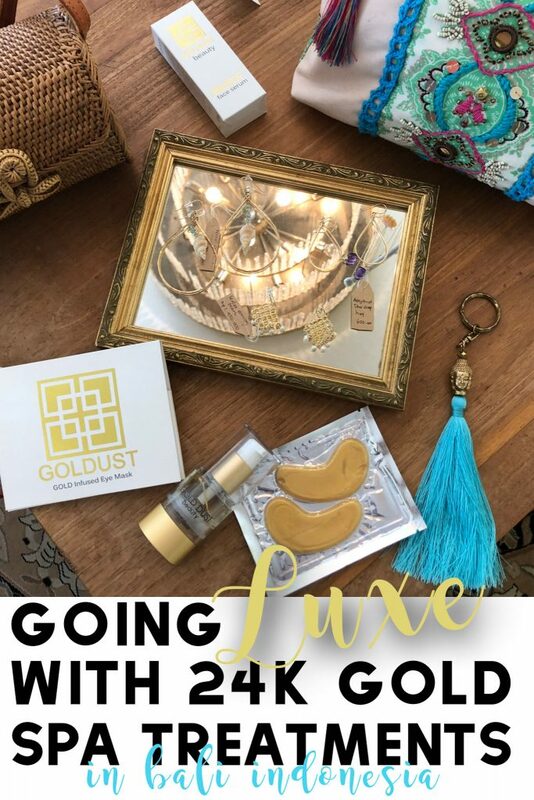 There are heaps of reasons you should add gold to your beauty regimen and the perfect place to start is a stop at Goldust during your next trip to Bali. 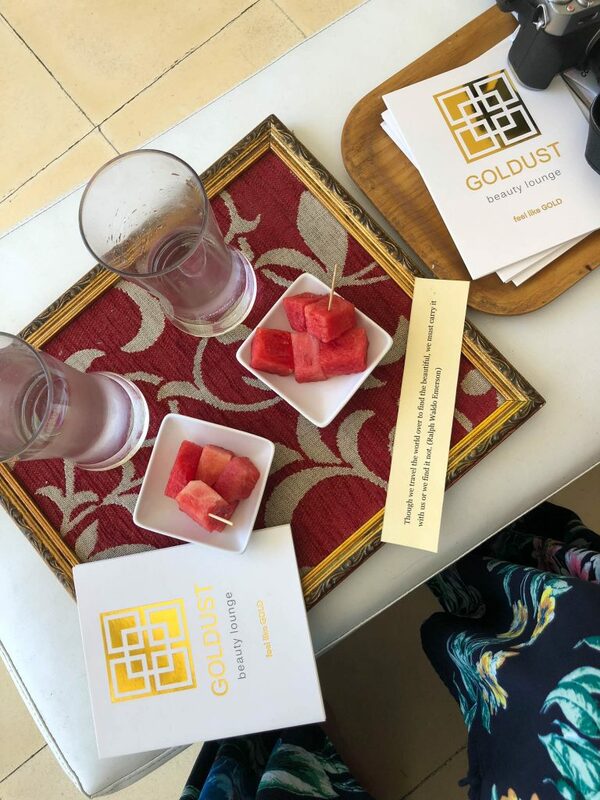 From stylish resort wear to the cutest clutches to fantastic therapists and of course because of the gold – you have every reason possible to book a treatment with Goldust in Canggu, Bali! Disclaimer: I was hosted at Goldust as a guest. My opinions, as always, remain my own.